Aesthetics are a huge part of what makes an abstract strategy game stand out for me. 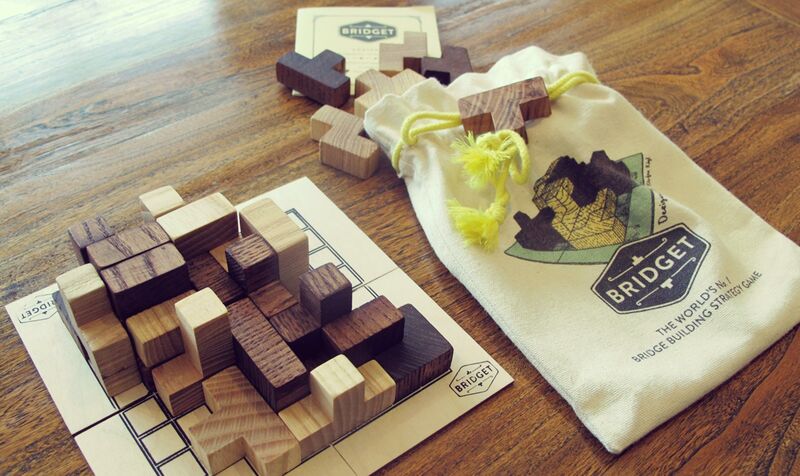 There is no better way to start in terms of great aesthetics than to make the game of wood. Call me old school but wooden games simply look better to me. That was the first thing I noted with Bridget, the chunky wooden pieces which are a huge plus. The game comes in a cloth bag, which is neat as it harkens back to an earlier era when everything was not in a cardboard box and shrink wrapped in plastic. However, while it provides a nice older feel, I have to concede nice cardboard boxes do store more easily on a board game shelf. So what is Bridget all about? Well the game has its origins in other games. 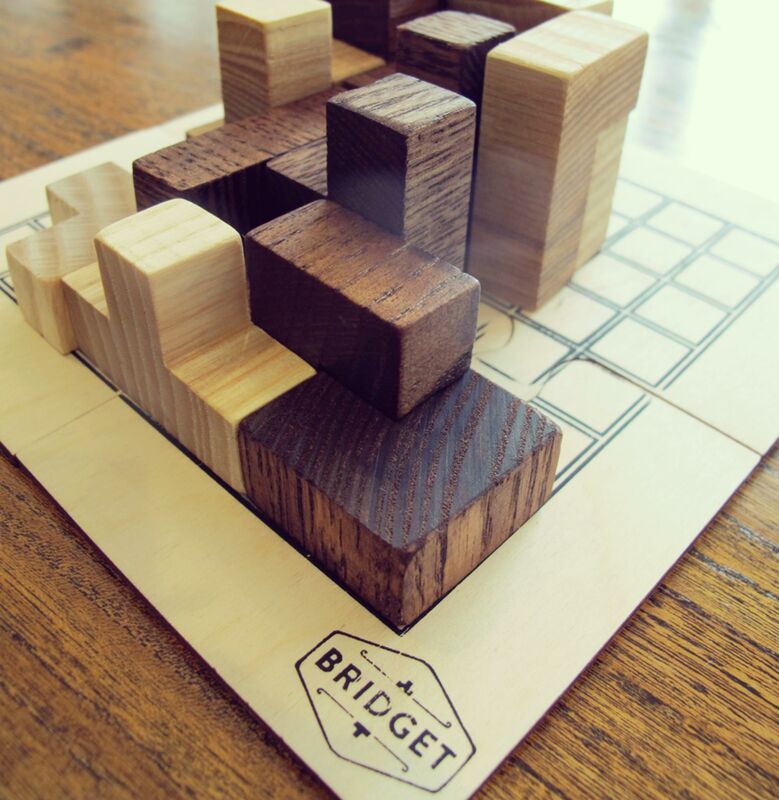 “Bridget is our version of the Swiss game ‘Caminos’ designed by Stefan Kögl. The original has won ‘Best Family Game’ at the Swiss toy awards. This game is too good to be monopolized by a nation of yodellers, so we’ve brought it home. 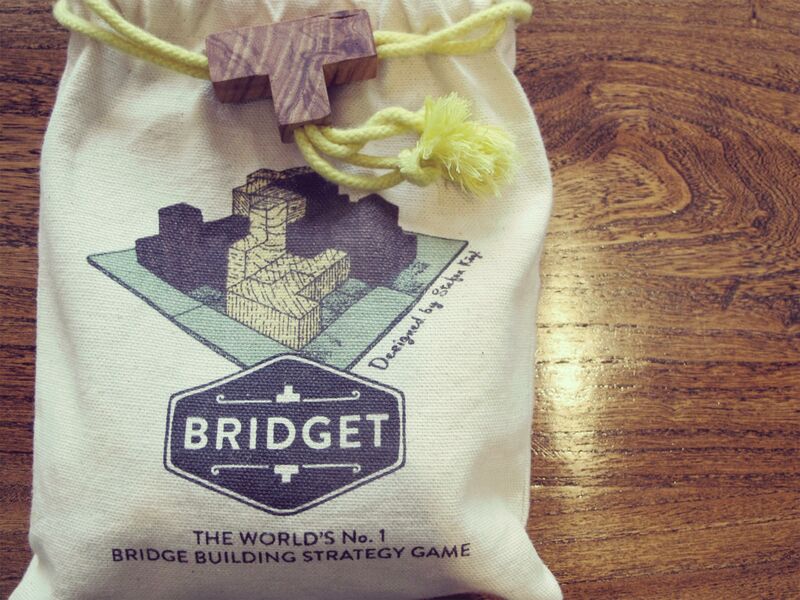 With the help of our partner Asha Handicrafts, Bridget games are handmade by fairly paid artisans in India. Asha’s profits are reinvested to provide the workers and their families with medical care, education and help with sanitation. To find out more about our supply chain please go to our website,” explains the rule sheet. The actual game remains straightforward. “Imagine a mountain goat taking a leisurely stroll across the board. The goat can leap up and down steps as big as you like. Your task is to build a bridge for the goat to cross. Both the horizontal and vertical faces of the bridge must be in your colour, so as to form a continuous line. Your bridge must be visible; it cannot be buried under your opponent’s pieces. Players can attempt to bridge from any side. New routes can be started at any time or multiple routes attempted at the same time. Bridge lines do not have to be straight,” explains the simple rule sheet. The goal of the game sounds simple enough, but there is a nice challenge to it. “Your bridge must connect two opposite sides of the board. If you’re playing on the octagon, then you can connect to the opposite side or a side next to the opposite side. 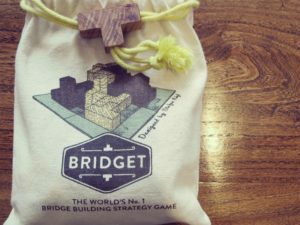 The end pieces of your bridge do not need to be at the ground level,” details the rulebook. The rules do offer some help for players starting out. Bridget is one of those really nice looking games that travels well, is simple to learn and generally quick to play. That makes it ideal for a trip to the coffee shop, or the summer cabin, where the replayability of the game will make it a popular one for many. Thanks to fellow gamer Adam Daniels for his help in running through this game for review.